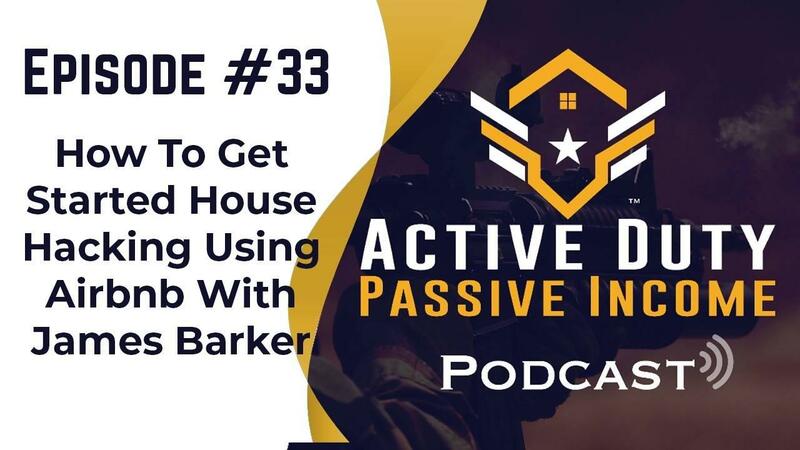 Hey what's going on guys welcome to the active duty passive income podcast. We have an awesome show lined up for you today. It’s an interview with James Barker and he's going to explain how he got started with his first property and Airbnb, stand by. Mike: Hey hey what's going on guys how you doing out there. Mike foster here and welcome to an awesome episode here in the podcast. I've got with me a newly investor, his name is James Barker. 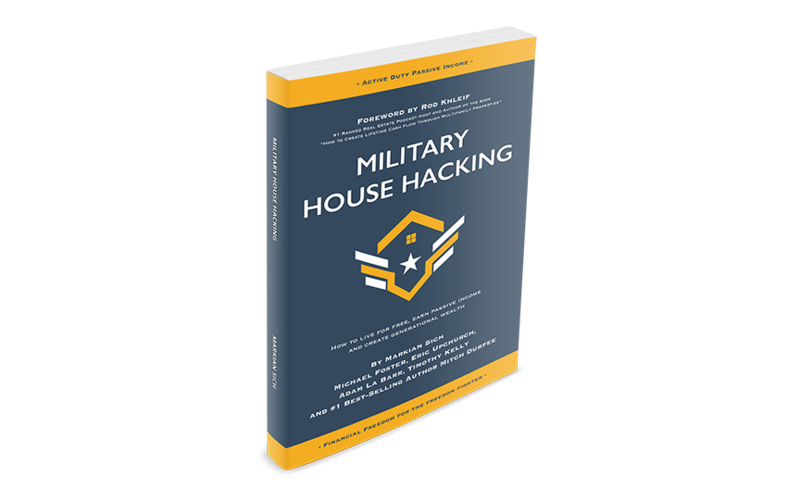 He’s in the military and he is super motivated with his story on how he uses Airbnb to get started with investing. James what's going on buddy? James: Mike how is it going man great to be here. I'm really excited to share what I got for you guys. Mike: Awesome and it's really really it's great to have you on and really excited to get your story out there to everyone. I know you share a story kind of similar to mine and getting started with vacation rentals. So but first tell us a little bit about yourself. James: Let me say I joined the military in 2012 during the Marine Corps. Went through flight school. Kind of the standard center pipeline there. Pensacola corpus and then over to New River on in North Carolina and I've been there since about three years now. So well enjoying it, got a long way to go. Mike: Yeah that's awesome man. So you just got started with real estate investing about how long ago? James: Oh I officially closed on my first property over a month ago. So yeah I’d called that officially one you know I've been looking for about a year now. But actually making moves for about a month. Mike: Okay all right hey man well there you go, you know you took the leap and that's honestly it's a step a lot of people have nerves over you know just kind of getting started. Mike: Can you walk us through a little bit on you know what you used to try and find your home. You know like how you did your research and just kind of how you come. James: So let me see I say first step was I started researching real estate when I was on deployment about a year ago and didn't really know much direction I wanted to go, single-family, multi-family. I mean there's a lot of different avenues as you guys know. So it was kind of overwhelmed with information and kind of what I wish route I wanted to go. So my wife's family vacations in Gatlinburg Tennessee every year and that kind of got me started on the vacation rental idea and once I dug down that rabbit hole, that's the rabbit hole I wanted to stay in at least initially. So I kind of that's kind of what I got started on doing that. I made the first contact with my realtor and say by the end of January and then me and him worked through a slog of you know finding the right house and going under contract and it not working out for seven months until we finally closed on a property. Mike: Wow can you share us with some of those hurdles, some of the hard points that you ran into along that way? James: Oh yeah absolutely. So specifically for the Gatlinburg area, it's a super-hot market right now, really competitive. If there's a property on the MLS for more than two weeks; it's probably not that great of a property or there's something wrong with it. It’s quite a hurdle to get into especially for a newbie jumping in and that was... the biggest hurdle was when I found the good property or my realtor found me good property it was a bidding war. A lot of properties are closing on more than asking value if they were really really good and what they typically specialize in that area are turnkey vacation rentals, very minimal maintenance, very minimal things you need to do they'll turn over everything fully furnished to you and then they have you know the really good properties have a really good rental history. So when you put those things on the MLS, people eat it up. So that was tough finding something that was good that wasn't as super competitive as everybody else thought it was. Mike: Okay was your property like a foreclosure or well how exactly, what exactly was it and how did you manage to get yours through the system? James: So it wasn't, it was I'd say poorly advertised. So on the surface it didn't look that great and when I first saw the property and went through all the photos on the website they weren't that good. The money that they said they made the last year wasn't super impressive and I started digging through on the property and it's like you know what these people are managing this completely wrong. This is kind of a diamond in the rough and once I dug into it a lot more, I realized exactly what it was. So all the super savvy investors who do this frequently kind of bypassed it. Because it didn't look that good on the surface and there was a lot of other properties you know to draw their attention to. So they kind of ignored this one. So it's on the market for about ten days before I actually made first contact with the sellers. Mike: Okay cool and so during that closing process, how smooth was everything from inspection to appraisal and to closing? Did it all kind of work out okay or? James: Oh no it wasn't smooth at all. It’s kind of exciting. I kind of like a little chaotic situations and this was definitely one of them. So I had a bank, a local bank that I was pretty much sticking with and I made contact with them February-March timeframe and told them that and I've actually gone under contract with a property earlier in June timeframe. So I was going to stick with them the entire way and they had pretty good interest rate and pretty closing fees at least one of the better ones that I'd found and then when I went under contract with this property, they jumped their closing fees up maybe four or five thousand dollars for the entire property. So closing was just shy of twenty thousand dollars and it's like you know what? That is extremely high. So I essentially throw them aside and found another Bank really really quick. This was already after we got another contract. so that was extremely hectic trying to find another bank that was in that short a time frame and still keep closing dates. Mike: But you found another bank. James: And I should have went with them first. It was the bank that I actually bought this house in. just a normal house first time buying a house single family home moving and it was that bank that I used and I didn't realize, I didn't really think about them for an investment strategy and I should have. Because I was familiar with the mortgage broker and he was really good and I should have went with him first and I could have saved myself a little heartache. At the end of the day it all worked out perfectly. Mike: Hey lessons learned right you know. Was this a local bank? A smaller bank or was this like a bigger national bank? James: The bank that I went with finally was the National Bank in Kansas City. They don't play any games and they didn't have any closing fees at all except, for like $100 for the entire Bank. It’s awesome. Mike: Notice the crazy difference in that right? James: Yeah it was real hard and the interest rate was pretty substantially better too. Mike: Nice. Okay awesome man wow. Well alright we'll see so there you go and now you know you are a homeowner. So you've got that on your belt and that's amazing. So with the vacation rentals so can you tell us a little bit on how you got started with that. James: Yeah so again my initial thought process was so doing a single family I kind of looked in the multifamily for a little bit and it was a little overwhelming to be honest jumping in straight away. I didn't have that many resources at my disposal at the moment. So I kind of went away from that single family home. I was already familiar with buying that but again kind of you know investing. It was a little somewhat overwhelming and vacation rentals I'd say a little more complicated. But I felt comfortable doing it and I'm not entirely sure why. It just kind of sat well with me and really what it came down to was you are going to earn a bigger return on investment on a single-family home or a multi-family home. I'm at least for a first guy jumping in. vacation rental was the fastest way to gain equity and gain capital and that's kind of why I went down that route and once I jumped in and it wasn't as overwhelming as I thought. So I stuck with that. Mike: Okay there you go man. Well like I said you know I commend you because you take that leap that a lot of folks have that hurdle you know and getting started. So first of all Bravo for that. Yeah absolutely you know just get in the home, a lot of people feel this anxiety you know and going through the deal. Even making an offer you know it can be really you know crazy. because then it's like alright well what if they don't accept it right or what if they do, you know what if they do accept your offer, now what? So craziest to figure out and of course you had your journey. But I'm sure you learned a lot right and I'm sure there's a lot that you can apply into going into your next one and even more so you took a jump into the vacation rental market. Which you know isn't as easy you know as I'm sure a lot of shows or people right make it sound. Definitely not but it's very lucrative right and it has the ability to bring up. So can you share with us some of the success that you've had so far with Airbnb or and even some kind of some of the lessons learned that you've experience along the way. James: So yeah my lessons learned at least going through the whole real estate process was a similar lessons learned everybody else. Just the whole just the step by step start to finish. It’s not going to go smooth. It’s not going to go exactly according to plan and that's okay. That’s completely fine. That why you educate yourself and kind of expect the unexpected and expect things to go a little left or right of what you planned and I think if you stomach that, then you'll be okay. My biggest lesson learned specifics for the vacation rental market, I kind of anticipated this as well. It’s tough getting a start and that's because you're getting a property turned over to you that doesn't have tenants in it. You’re getting a property that is most people don't plan their vacations a week out. So you're creating a listing on Airbnb and VRBO and you're completely fresh with no reviews and no turnover whatsoever and you have a mortgage payment due in a month, with all your bills. so that initial jump was I'd say I expected it to be a little hectic and it was just getting all those initial bookings for the first two months I would say to get you stabilized. that was a lesson learned and I'm glad I did my research with that and kind of planned ahead and set money aside to cover you know it's like catch up essentially. Mike: To cover those expenses in the meantime, smart. James: Another huge lesson learned, I kind of expected it honestly to be a little more work. I don’t know if that makes any more sense. But you know dealing with the customers and dealing with the booking dealing with everything like that, once you get everything automated and find a system for you; it really isn't that much work. I sent a couple emails maybe once a day, you know maybe every other day. You know me text my cleaning service and kind of you know I have a good relationship with them and once you build all those contacts and get everything kind of automated and on the system, it really isn't that much work. So which was unexpected in a good way. Mike: In a good way well you know you planned ahead, you're right and I think you really touched on something I want to kind of come back to here. Finding a system, that is key and I think that's key with investing in general right. Because so much chaos can come into the mix and add a lot of stress. But when you have a good system in place, you know it definitely takes away a lot of that stress and slows everything down for you right. Allows you to process it. But can you explain to us a little bit about your system and how you go ahead. James: So I'd say typical vacation rentals have a property management company. I mean I'd say typically I don't and the reason I don't is because again specifically in the gallon Barrera, they charge a huge percentage off the top; thirty-forty percent off the top. You can't make money if you're going to use them. If you have a mortgage you can't make money. Mathematically impossible for you to come out in the green. So jumping into it, I kind of had that hurdle to go with and you know reading a couple books and I'll touch on those a little later. You really don't need a property management company. The key things you need are a cleaning service that you can trust, wholeheartedly with your property and then a maintenance crew to trust that is not going to rip you off and really those are the two biggest things. If you have those two things in place they're on the ground, you'll be okay and then in terms of your management your organization back here; I run everything from my phone. You know I made that property happen from my phone. Yeah I have stuff in my computer obviously. But for the most part you know I bought my emails organizing my phone. My Airbnb and VRBO apps are all in my phone. You know it's how what our organization system works for you. but those are the biggest factors I'd say to succeeding and you don't need a property management company and really and maybe it's a little arrogant on myself. But I figured you know what I can do better than the property management companies. Because it's my property and I care about it more than they do. If they have 30-40-50 properties to manage, there's no way they're going to run mine as well as I'm going to manage mine if I have one you know now or two or three. So especially with a good cleaning service and a good maintenance company in place, I can do it better than they can do. So that's kind of what led me to doing kind of the route that I went. Mike: Right no that's fair man. That is absolutely fair. I mean it is your property right. So I mean of course you know just like anything, if it's yours you're going to take better care of it than someone else. That’s a fact. So now that's awesome, that is awesome. So I'm very preside. So you run it from your phone and you just use the Airbnb and the VRBO apps right. You just use those okay awesome. So we're very very similar man. Yeah I do those as well with my rental. It was clutch while I was out in Dubai past deployment. Because I had the ability to go in and use those apps [17:41 inaudible]. But right you know it's not as hard as people think and I think that once you have that system in place, like you said with your emails and stuff it just becomes push button at that point. James: That's it, that's it you just have to stay organized. Which is true of anything honestly. It’s not specific to the vacation rental market. Let’s say in life and real estate you know in your job you have to be organized. So this is just another thing you got to be organized at. I say this is very very tough to do if you're not organized and you're kind of shooting from the hip I think you're going to be hard pressed to do well in it. Mike: Exactly that's a good point man. It’s a great point and you've got your head on straight. Honestly I wish you best of luck and success with this. But so can you tell us a little bit about where you're looking to go, what kind of goals you have in mind? James: So I guess the different properties there you know you have two bedroom three four and they have these huge log castles that are there. So at least for me jumping in initially, I wanted to get because at the end of the day it's just as much effort for me to run a single bedroom as it is a log castle, once it's all set up. It’s the same effort managing bookings and you know maybe there's a little more maintenance on those huge properties. But at the other day it takes about the same effort. So I wanted to get the biggest property that my budget can afford. So that's what I did. I essentially when I found this property I would say it was almost slightly out of budget. But I tapped myself enough to do it and I'm glad I did. So my next goals are I really like this property. So I don't want to sell it right now and you know do a 1031 exchange to a to a larger property. I kind of want to hang out with this property and get properties of similar size or maybe just a little bit smaller, two bedroom three bedroom. Pick with the four bedroom property and currently the one I have right now is a four bedroom four and a half bath. About three thousand square feet or so. It’s a nice property. Yeah so similar sizes like that, I think are good for now. Mike: Right. I agree that's awesome, keep it big. Then it gives you a lot more options. You mentioned real quick about the 1031 exchange. Do you mind just breaking it down bare-bones for some of our listeners who might be new to that concept? James: Yeah so again when I had my first of the research on you know taxes and everything, I imagine it was the same as it avails super overwhelming; there's a lot of stuff to learn. A lot of big numbers, a lot of big words. So 1031 exchange you can defer your taxes that you make from selling the property if you buy another property within a certain time span and most people use the 1031 exchange to go from a small appropriate say to a larger property. Whether it be you know multifamily to a bigger multifamily or for this you know it would be my four bedroom to I'd say like a six or seven bedroom log Castle you can call it a Gatlinburg. super useful tool, definitely on the table in the future you know and realistically it's the same amount of effort like I talked about running a four bedroom than it is a six bedroom. So you really you're just increasing the size your property with not really much effort, extra effort putting into it. Mike: So awesome man. All right man good to go. So yes so I definitely am really really glad to have gotten you on here man. I think I heard a lot of really good wisdom you know for those who are getting started and I appreciate it. I want to take you real quick through our bonus round okay and just three simple questions just to kind of gauge you know your mindset and where you're at and also just for our listeners to kind of get to know you a little bit. Can you tell me what your favorite book is? James: I'd say a mountaineering book and end Vestures was I don't want to butcher it, I'd say he was the first American to climb the fourteen, 8,000 meter peaks in the world without supplemental oxygen. He’s a pretty tough dude and the reason why I like his book is one I like mountaineering. so it is you know I enjoy it and it's awesome and two, it brings about a pretty good life lesson and that it's this guy Ed had this goal of doing this for he worked on it for you know almost two decades and he just kept persisting on it and he had his long-term goal in mind. He didn't let anybody to turn him, he didn't let almost getting killed multiple times to turn him. Little extreme for the real estate side. But it's a good mindset to be in and set a long-term goal into just keep slogging away at it. Just keep chipping away at it. I really like the book. Mike: That's incredible man. Wow. Yeah I love hearing books like that you know mindset books. Because you know I think that's something to a lot of people. They get too focused on the real estate but they don't understand that's the biggest battle that we have is in our mind right. Mike: And being able to push through that is, it's important. James: Anybody is smart enough to learn the specifics of real estate. But too actually to do it and to get your mind right for what you're going to encounter, that's definitely the tough part. Mike: Yeah I agree. Definitely, agree. Okay so question number two, who is your biggest hero and why? James: I'd say maybe a cliché answer for this. I'd say my parents and I don't want to single out one or the other. Because they're, I mean they're both great. A little personal bias on that. For example like my mom, my dad they went out to the; so at this cabin that I bought. I bought it without going and physically looking at it. So I bought it, I bought it off of the again a very trusted realtor taking a very detailed video of it and that was good enough for me. My parents were actually the first ones out to the cabin and it was totally mismanaged and they were the ones who initially put up all the new decorations and put in you know the new TVs and stuff like that. So they had been completely supportive of everything I've done. So I wouldn't be here without them honestly, literally and figuratively. Mike: That's incredible and you know what I mean absolutely now give that respect to your parents. Because they're a huge support and obviously great influence. But I want to touch on something real quick. Because this was actually conversation, very funny at this came up. A conversation that I had earlier about buying properties without actually having been there and you know seen it. Can you walk us through you know like yeah how did that all happen? So you said that your Realtor took a video of it? James: Yeah so I'd say important, most important thing is whoever is there looking at it, do you trust them. Are they on your side or are they just trying to make a paycheck? And it's okay if they're trying to make a paycheck. But as long as they're on your side and you fully trust them. My realtor is awesome. He wants [25:52 inaudible] properties that I thought were good and he's like James you don't want this. You don't want this property and here's why and someone that's you know in the you know realtor market that tells me I don't want this property, I trust him legitimately. So whenever I sent him out to this property and he's like you know what this is awesome, this is a great property and he started taking off boxes that I loved. Like he's like the yard is completely into landscaping, it's completely neglected. It’s dirty, there's a lot of TLC that needs to get done and that's just you know checkboxes that I like and he was the one who sold it to me. He was like you know what this is a good property. Obviously you know I wasn't going to do it blind and pictures don't do a justice. So he took you know a handful of really detailed videos and put him on YouTube for me and that was good enough for me. His word plus the videos that was enough for me. Mike: I guess that foresight to kind of you know go into that property knowing what you looked for and then being able to pick apart each property piece by piece and to give me that picture, that clear picture and took videos. So you can verify and see with your own eyes. That’s amazing man. That is absolutely amazing. James: It's a long-term game for them as well. I mean they survive off of recommendations and I told them from the get-go, his name's Steve and I was like hey Steve I mean this isn't the only property I'm going to purchase. This is a long-term game for me. I want you to be my realtor and if this works out, this is not going to be the only property that I purchase. Which I'm sure a lot of people tell their Realtors to start off with and you kind of have to say that to get your foot in the door. But when I went under contract the first property, that's when I think he realized I was serious. Because I'm sure they get a lot of people that aren't serious that just kind of shop around and don't do anything. when actually willing to put money towards it, that's when I think and I noticed that he noticeably took a different approach with me once he realized I was legitimate and since then that's, it's been awesome. Mike: Outstanding man. Outstanding and congratulations on that you know. Because I think that every good real estate investor has an equally good team if not better right to kind of help them out. James: You can't do without them. Mike: Can't do it. So that's awesome and congrats and best of luck to your future and investing in that area, that's crazy. All right guys whew man I love it that was powerful, that was an awesome. All right question number three. Okay what nuggets and you've already given us a bunch of Nuggets out there for folks who are getting started. But if you can keep it at three, what three you know or one or two whatever right do you have for those who haven't gotten started yet but are looking to take that step. James: Okay let me see I'd say first and foremost you have to educate yourself and just like most people will send us or most likely in the military you can't get good at your job without educating yourself. Experience will never carry the day if you're not willing to read and willing to learn about the subjects that you're trying to become a master in this case real estate. You have to study, you have to read books, and you have to be obsessed with it. If you do that, that'll help you carry the day when things don't go your way and that kind of leads into my second nugget, which is stay persistent and don't get discouraged; especially starting off. It’s so easy to not commit yourself to this starting because you haven't really committed to anything. most likely haven't committed financially, you've just committed a little bit of time and it's really easy when things don't go your way to just kind of pick up your toys and leave and that's I would imagine why a lot of people don't get started doing this is because it's hard to start and that's okay, it's expected. Just stick with it. Everybody got started doing real estate or doing this for a reason and that was whatever your own personal opinion is. But you wanted to better yourself in some way and better your life and better your family. There’s something that sparked your interest to do this. So when things get difficult, think about that. Think about why you started it and just go back to that. Things are not going to go your way all the time and that's just something you have to swallow and accept with really anything that you do and this is no different. So just stick with it and I'd say my third nugget which kind of came naturally and kind of it makes sense when you think about it is, you have to be a good person and when that really is going to carry the day is you got to realize that everyone that you're involved with is trying to you know better themselves in some way. Whether it being your real estate agent, your mortgage broker, your banker, your accountant, your CPA they all have a profession and they're all trying to... that mostly is their source of income. Realize that they're human too. They make mistakes and you want to set yourself up to be the person that they don't want to see fail. If you're a good person and you are real with them and you're not phony or counterfeit or put on an image because you're in a business, they're going to see that and they're going to see that you're genuine and they're going to want you to succeed and they're going to go out of their way rather than you just being another one of their clients. You’re going to be the one that they really are putting stock into. You got to become that person and that starts off with just being a good human being. That’s carried me a lot further than I thought it would and has come through in ways that I didn't think it would and I'm thankful that that's how it played out. So those are my three nuggets to everybody getting started with this. Mike: Dude that's amazing man, absolutely amazing and great points. All of them. Honestly I think you even gave you know a fourth one riches you know things aren't going to go your way. You know I know it kind of you know go synonymous with stay persistent. But it's a hard you know truth not only in our job you know in the military. But also in real estate you know I mean things are not going to go your way. But you have to be flexible and you have to be adaptable and you are right, you got to stay persistent. That legit man, very very sound and thank you so much again dude. I really appreciate your time James. I mean I know you could be doing a whole lot you know more or you could really be sleeping or like this time you know. Yeah what is that right? But we really do appreciate your time and your attention to motivating you know those folks out there that are looking to get started or maybe something to have just gotten started and needed a little encouragement and so yeah so thanks again and welcome to the ADPI team and our movement out there. James: Glad to be here, glad to help you guys out and we didn't really talk much specifics in terms of the vacation rental. Kind of like you know almost like a whole hand-start. so if anyone has any questions and I know a lot of people when they start off doing something, they listen to podcasts for example or they read books and I'm like well that doesn't really help me get started specifically with the first step. If anyone has any questions on how to specifically get started we didn't cover it in the podcast, but I'm totally here to help you guys. Find me on Facebook. I'm on the Facebook group. I mean I'm here to help you guys out. But I'll definitely be there to help you with specifics. Whether it be just getting started in real estate or vacation rentals. Unless you want to run numbers by me and talk you know legit numbers, I'm here to help you guys out. Mike: Awesome man that's great and you know what we can bring you back on the podcast you know in a later date and we can go you know there's some deep dive and some specific Airbnb topics that would be great. I like it alright thanks again for your time, take good care. All right man I'm so motivated. That was an epic interview. Thank you so much James for your support and please if you guys have a story out there that you would like to share, come share it with us. We love to talk to folks who are just getting started out there. Because you guys motivate other people to go out there and take action and start building their financial freedom. All right if you are looking for some help, come reach out to us. Www.activedutypassiveincome.com. we have a full course set up as designed to help take you from zero to close and you'll also get the benefit of our start the spark network where we physically mentor you throughout the process. We hop on a phone call we help find exactly what you're looking for and we help take you step-by-step okay. Really looking forward to connecting with all of you guys, thanks again I'm out of here.